The world will not miss Belmokhtar, but in a perverted irony, the world, and the Saharan region in particular, may have become a more dangerous place. On the June 14, the Libyan news media reported that, Mokhtar Belmokhtar, the mastermind of the Algerian Im-Amenas gas processing plant attack, which left 38 hostages dead, had been killed. Belmokhtar, an Algerian, is believed to have been with several members of Ansar Al-Sharia, a Libyan terrorist organization, in the town of Adjabiya, which is located south of Benghazi, when two American F-15 fighter jets carried out airstrikes on the location, presumably killing the terror leader. Belmokhtar, if he is indeed dead, has been involved in jihadi militancy since the age of 19 when he travelled to Afghanistan to participate in the jihad against the Soviets. Upon his return to Algeria, he continued his militancy, eventually rising up in the ranks of the Armed Islamist Group (GIA) and later the breakaway Salafist Group for Preaching and Combat (GSPC) and its final iteration, Al-Qaeda in the Islamic Maghreb. 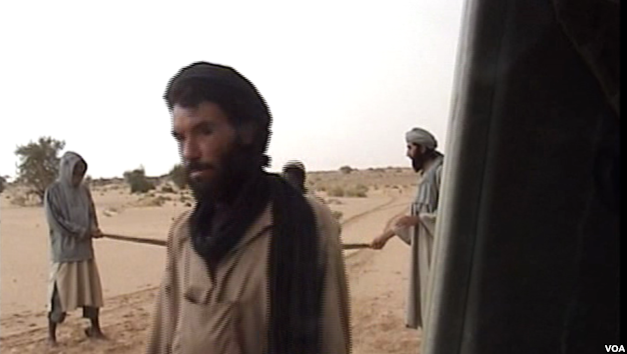 Belmokhtar was among the first commanders to be sent southward into Mali to set new operational frontiers in the Sahel. It is from these frontiers that Al-Qaeda in the Islamic Maghreb (AQIM), alongside Tuareg rebels from the National Movement for the Liberation of Azawad (MNLA) and other Islamist groups, surged into the international conscious taking control of vast swathes of Mali, all of which was made possible by regional instability brought about by civil war and the crisis in Libya resulting from international intervention. Tensions within the Al-Qaeda affiliate though, such as refusing to answer phone calls, failing to turn in expense reports, and ignoring scheduled meetings (yes, even terror groups have to fill out paperwork), led to a parting of ways and the subsequent formation of a new group led by Belmokhtar: al-Mouwakoune bi-Dimaa (also known as the Signed-in-Blood Battalion), which appeared to be an extension of his al-Mulathameen group (the Masked Men Brigade). The group rose to international attention after the attack on Im-Amenas. The group formed a relationship with a faction of the Movement for Oneness and Jihad in West Africa (MUJAO) through cooperative attacks on targets in Niger and formed a new group Al-Murabitoun; the Sentinels. Belmokhtar’s prominence in Saharan jihadi circles for over two decades and his group’s operational capacity to carry out deadly attacks across the region, along with his ties to Al-Qaeda, had made him a prominent target of US counter-terrorism forces. Reports emerging about Sundays strike on Belmokhtar are full of triumphalism, but the celebrations may be short lived. For all the innocent lives lost attributed to Belmokhtar, and there are many, his loss may not be the best outcome for the region. The death of Belmokhtar comes at a time when the Libyan branches of the Islamic State (or ISIS), Wilayat Barqa, Fezzan and Tarabulus has been exploiting the turmoil in Libya and expanding their presence in the region. Belmokhtar was ideologically aligned with Al-Qaeda, even after his withdrawal from AQIM, and was thus a natural counterweight to ISIS expansion. The most obvious demonstration of this is when Al-Murabitoun’s deputy, Adnan Abu Walid Al-Saharoui, discordantly pledged Bayah (an oath of allegiance) to ISIS on a Mauritanian news broadcast, only to be rebuked by Belmokhtar who reaffirmed his, and his group’s, affiliation with Aymen al-Zawahiri and AQ. The internal divisions about which direction to group should be heading in regards to the pan-Islamic global jihad were clearly coming to a fore within the group between the former MUJAO members under al-Saharoui and those loyal to Belmokhtar. Al-Saharoui, who reaffirmed his pledge to Baghdadi, has joined ISIS; and whether or not those who were supportive of Belmokhtar follow suit is still open to debate, but with AQIM still weakened by the French led African Union effort against them, Al-Murabitoun had become the de-facto spearhead for Al-Qaeda in the region, and its potential shift to ISIS would be a disaster. This increased Islamic State presence and influence in the region will likely be realized in how hostages are dealt with from here on. Belmokhtar was well known for his criminal exploits in the Sahel, and the kidnap economy is amongst Al-Murabitoun’s most profitable enterprises. The funds received from hostage taking was primarily used to finance terror operations, thus the hostages had value, and anecdotal evidence from previous hostages reveal Belmokhtar generally treated them well. ISIS, though, as we have been so viscerally exposed too, does not offer hostages such luxuries; neither do they seek ransom for their captives. Instead, they prefer to cut off their heads. This behavior towards captives seems to have been embraced in the region, especially amongst those who are ideologically aligned with ISIS and have pledged fealty to them. The first instance of this occurred when ISIS aligned Algerian based group Jund al-Khalifah fi Ard al-Jazayer (Soilder of the Caliphate in Algeria) beheaded their 55-year-old French hostage Hervé Gourdel, who had been kidnapped whilst hiking. This occurred shortly after ISIS released a message imploring its supporters to kill the citizens of any country which conducted strikes against it in Syria and Iraq. Since then, its Libyan branches have followed suit, with the graphic videos depicting beheadings and shootings of 21 Coptic Egyptians and 28 Ethiopian Christian hostages in February and April. This trend is likely to continue, and now with an unknown amount of former al-Murabitoun members now operating under the auspices of the Islamic State, could get worse. Al-Murabitoun has vast experience and capacity in carrying out kidnappings and leveraging their local connections with nomadic communities to help locate, capture, and move hostages around the Sahel. If the new captors are under instruction from ISIS, their home countries will likely not get a ransom call. His Romanian passport may shield him from potential harm the way an American or French would probably not. Alternatively, the revenues from hostage taken may prove too valuable for al-Murabitoun to simply start killing all its ‘assets’, as would likely be the wish of the Islamic State. Belmokhtar’s demise—which I should stress is still unconfirmed, with conflicting reports appearing in the media—in and of itself is a viewed as a win by the US as its government gives itself a congratulatory pat on the back, but the consequences of his absence could very well lead to an increase in presence for the Islamic State, who can use al-Murabitoun’s deep ties with Berbiche and Tuareg nomadic tribes to extend its influence across the Sahel. The world will not miss Belmokhtar, but in a perverted irony, the world, and the Saharan region in particular, may have become a more dangerous place. Michael Duffy is a freelance writer from the UK who focuses on international relations &and security.